Jennifer Hill, our VP of Business Development, joined an esteemed panel of presenters headlining the HSMAI DC chapter's 2018 State of the Industry held at the MGM National Harbor last week. The event coincides with many hotels’ budget planning seasons so, presumably, attendees were looking for DC and U.S. national trends, key performance indicators and insights around which they can base their budget projections for 2019. Mark Woodworth presented a conundrum. While occupancy across the industry has maintained a more-than-healthy percentage since 2010, ADR has not been growing in tandem since Q2 2015. 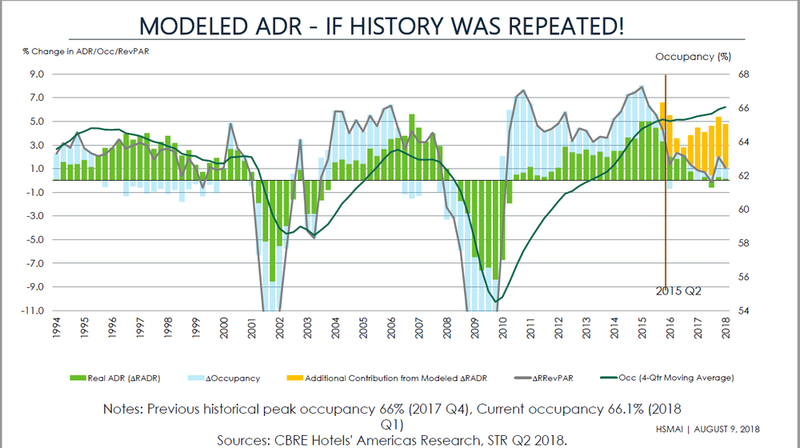 Modeled ADR - CBRE HOtels' Amercias Research, STR Q2 2018. Historically, and rationally, as the law of supply and demand would dictate, occupancy and ADR have remained tethered in their growth and decline. This recent anomaly, or at minimum abnormality, coupled with John Hach’s analysis showing softness in on-the-books reservations for 2019 gives pause for concern, or at least potentially re-considering a less aggressive RevPAR growth projection for the 2019 budgets currently being planned. Woodworth mentioned that CBRE has come up with 15 different hypotheses as to what could be causing this so-called conundrum, and I’m sure you may be thinking of a few yourself right now, but one thing is clear, if ADR isn’t rising in lock-step with occupancy, you will need to squeeze every dollar out of your Net RevPAR with an intelligent revenue strategy. Jennifer Hill spoke at length about the different ‘types’ of revenue that can help revenue managers and strategists compare each channel or source of business apples-to-apples by removing the costs of acquisition they incur. Having this depth of data is often the hard part, but Kalibri Labs has spent the last six years building a best-in-class database of over 31,000 hotels across the U.S. that not only tabulates ADR, Occupancy and RevPAR, but tracks the cost of acquisition so you can see beyond what might appear on a hotel’s P&L, the Hotel-Collected Revenue. Hill explained that understanding the Guest-Paid Revenue, or the rate the guest actually transacts when they book, is very important and is often, depending on the booking channel, far different than what would be remitted back to the hotel by a third party. It is also critical that those costs of acquisition are considered and tracked when formulating your 2019 budget or any time you’re thinking of making a shift in your hotel’s revenue strategy. COPE Revenue, she joked, is your way of ‘coping with third-party acquisition costs,’ but it is a very real and important acronym in the revenue strategy vocabulary she presented, meaning Contribution to Operating Profit and Expense (COPE). COPE Revenue is, simply, Guest-Paid Revenue with all direct transaction-related costs removed. Going one step further, by also removing sales and marketing expenses, a hotel can view their Net Revenue. So how do you get your hands on this level of data? Our ETL (extract, transform and load) process normalizes guest folio datasets from brands across the industry, including the channel and rate category through which the guest booked, when they booked, whether they are a loyalty member, and the acquisition costs associated with that transaction, such as commissions (retail or wholesale), loyalty investment, and channel costs. This data is used to derive Guest-Paid and COPE Revenue from the Hotel-Collected Revenue total that a hotel is accustomed to seeing. With this information, revenue strategists can draw much more valuable insights understanding where lies the most profitable business and then develop an action plan to go after it. So how could you use these insights? If you are a DORM or asset manager, for starters, you would want to utilize Hummingbird PXM, our hotel revenue strategy digital platform, that shows your business mix using the detailed revenue types outlined and defined above, but also allows comparison and benchmarking to a customized benchmark group or selected comp set. Hummingbird PXM refreshes data every month, so it most definitely should be part of your ongoing revenue strategy discussions and decision-making process. For all the reasons highlighted at the HSMAI State of the Industry event, this budgeting season is the ideal time to understand all the intricacies of your market, and benchmark against your hotel’s revenue performance in order to better prepare your hotel for what could be an uncertain 2019 in Washington, DC. Newer PostWhy is Revenue Strategy the answer to today’s challenges?